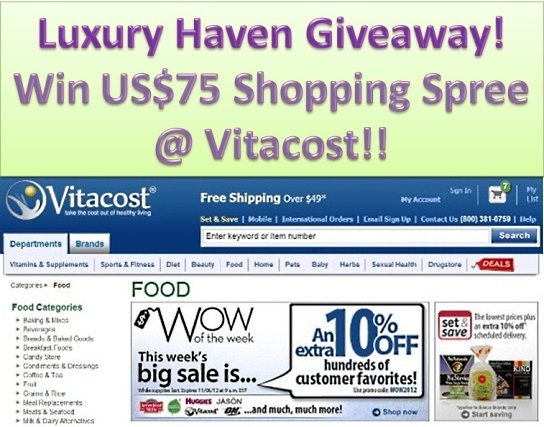 You are here:Home » Vitacost Online Shopping » Luxury Haven Giveaway: Win US$75 Shopping Spree At Vitacost!! Thanks to Vitacost, I'd so much fun shopping online lately. Beautiful Bodum Pavina Glasses, Alba Botanica Cleansing Gel, Vitacost Health Supplements, Dog Treats, Nail Polish & Buffers, are all what I'd bought during the spree. Now, you've the chance to shop with me too! Luxury Haven is offering 1 lucky reader to go shopping with me, courtesy of Vitacost! In my last Vitacost US$50 International Giveaways, two US$50 voucher codes had been given out. But due to shipping restriction in my last Giveaway, Vitacost has cancelled one of the US$50 vouchers & kindly replaced with a more attractive US$75 one instead. This Giveaway is Open To All in the countries above, & Vitacost ships to more than 40 countries worldwide. So before you enter the sweepstake, make sure you go to Vitacost International Shipping to check if your country is in the list! Good luck! Joining this Giveaway is easy. The more steps you complete, the more chances you'll get! All entries will be validated, so do not hit the "Enter" key if you haven't done the steps or you'll be disqualified! Contest begins on 6 Nov 2012 & ends at 12.01pm on 16 Nov 2012. Thank you again Vitacost, for sponsoring this Giveaway! Hope to win this to get some brands / products that aren't available in Singapore. I wanna get some treats for my greedy cats. I want to get some anti-aging products for my mom. I am going to get something for my family for Christmas! Vitacost a better way to save money. Hope to get some supplement at a lower cost. Hoping to shop for some awesome Christmas gifts without having to squeeze in the crowd during Christmas shopping in the shopping malls. With a few clicks...I can sit back and relax while waiting for my gifts to arrive. Thanks for the heads up my friend, I did most of the steps. good luck to everyone! In addition to many fine products, they have cooking ingredients -- yippee! I have never shopped at Vitacost, so I would love to win this! I love that I can order the supplements, and have them delivered to my door, and not have to go through store after store looking for one in particular...too easy! Vitacost is a great site for almost everything you need. Thanks for letting me know about the giveaway! Would be nice to win and be able to get some unique christmas presents from brands not available in the UK! Have never shop at vitacost before so I start to browse through the website and so many things attract me to buy. Vitacost has such a wide variety of items for great prices! Would love o win this to order supplements from vista cost. Have ordered from them before and love them! I would love to win because I love their grocery section! I'd like to win to buy organic skin care. I only know i just love Vitacost! Their products are just splendid.